In 1962 Mick O’Donnell started a band called the Downliners. Their name was taken from the Jerry Lee Lewis song, "Down The Line" and they soon were playing locally in Twickenham. After a short but ill-fated tour of US air bases in France, the band broke up. A year later, Mick O’Donnell (now Don Craine) and Johnny Sutton (drummer) formed the Downliners Sect who quickly established themselves as a popular r&b act playing many clubs in London. The line-up was Don Craine (rhythm guitar and vocals), Johnny Sutton (drums), Keith Evans/Grant (bass), and Melvin who was quickly replaced by Terry Gibson. The Downliners Sect were raw much akin to the Pretty Things but a most definitely the match of the early Rolling Stones and Yardbirds. The band’s interpretation of blues classics was both loud and aggressive and they gathered a loyal following. Rod Steward, Stevie Marriot (Small Faces) and Van Morrison (Them) were all fans of the group. On stage, as a gimmick Don Craine wore a Sherlock Holmes-hat which he felt added to the mystique of their name. Their first recording in 1963 was an EP (extended player later known as maxi single) featuring the band playing live at Studio 51, London. The release had minor impact in the UK but became popular in Sweden mainly due to airtime given to it by a Swedish pirate station (Radio Syd). Although the band did other recordings these were not released for two decades, by which time recordings by the Downliner Sect were collectable. 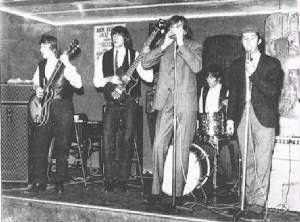 The Sect became the resident band at Eel Pie Island and Ray Sone (harmonica) joined them in 1964 with his distinctive harmonica playing. They signed with Columbia and released "Baby What’s Wrong" which again failed to make it to the charts in the UK. Their first album "The Sect" was recorded later that year and although it too did not sell that well it would become a classic album of the 60s R&B genre. Unsure of their lasting appeal as an R&B outfit, Columbia released ‘Little Egypt’ which was a novelty single. Little Egypt shot up the charts in Sweden and gave the group a Number 2 hit. Pip Harvey replaced Ray Sone in 1965 and the Sect went to have a successful tour of Sweden. On their return the group followed up this Scandinavian success with the release of a four-track EP called "The Sect Sing Sick Songs". This was a quartet of death songs, a genre which had enjoyed some popularity in the charts at the time, including hits by The Shangri-Las’ (Leader of the Pack) and Twinkle’s (Terry). Eccentric, Screaming Lord Sutch also enjoyed some chart success with Jack the Ripper and whether ‘The Sect Sing Sick Songs’ was an endeavour to jump on the bandwagon of rhythm and horror genre is not quite clear but the band had abandoned their R&B roots. The songs were banned by the BBC which gave them some degree of cult status but little else. This was followed by a county album, called the Country Sect which was a complete commercial disaster. Country music had been predicted as the likely successor to the English Invasion but it did not quite happen. The group’s change in style had not endeared them to their old fans nor had it won them many new fans. In 1966 they released "Glendora" which was an attempt to emulate Ray Davis’s satirical Dedicated follower of fashion, but it did not hit the spot. Now reduced to a four-piece (harmonica player Pip Harvey had left) they tried to retrieve past glories by returning to R&B basics with the album "The Rock Sect’s In." However, the quality was not there and punters were no longer listening to white boy blues. Terry Gibson and Johnny Sutton quit the band and although Don and Keith Grant carried on as Don Craine’s new Downliners Sect it had little success and in 1968 the Downliners Sect split up. Whilst the band seemed to lose their direction by either trying to follow popular trends or just being mis-managed they slipped out of the main stream. However, the impression the Sect left with younger listeners was to prove important to their future in the decades that followed. In the 70s many of the punk generation regarded the Sect as early forerunners to punk music. Realising this Charly Records re-released the three original Sect albums plus the EP "The Sect Sing Sick Songs" and the band was resurrected. They reformed with some of the original members and more or less have continued to entertain and record ever since. Currently they enjoy a following on the retro circuit. You say that they made no more recordings for two decades after "Nite in Great Newport Street" in 1963, but their first album "The Sect" was released the following year in 1964, followed by "The Country Sect", and "The Rock Sects In. The EP, "The Sect Sing Sick Songs" was also released around that time. Not to be forgotten are the 9 singles released from between 1964 and 1966. The only record to be quite recently released, as the original master tapes had been lost, is "Brite Lites, Big City". Recorded in the early/mid 60's, and the artwork for the sleeve printed, the actual record was not released until a short while ago - nearly 50 years later !! !